It is never too late to change our minds and ease the pain. Marriage counselor and author, Gary Chapman, “The Five Languages of Love” writes the ideal candidate for marriage is a person in their late twenties/early thirties, who, regardless of his or her upbringing, spent the time discovering one’s natural talents and then explored different ways to develop those talents for employment and career paths. They have also viewed life as an adventure and tried different things so that by the time they are ready for marriage, they are actually ready for marriage and the commitment a healthy, fulfilling marriage needs to grow and thrive, as do the partners. However in a world dominated by the “Disrespect Philosophy” instead of “The Respect Principle” many people’s early years scarred people’s hearts, jaded their minds, and clouded or covered their true identity … talents, passions, and interests … because the “Disrespect Philosophy” seeks to keep people small, limited, unhappy, and unfulfilled as a person, which a person brings to all relationships, especially one’s marriage. Unfortunately, as the divorce rates show, the strain this brings to a marriage is also the ball that breaks a marriage with events such as affairs, debt creation, mid-life crisis, and more. As difficult and heart-wrenching as divorce or violent ends are to a marriage, the gift of the broken marriage can be the wake-up call to discovering more about one’s self … or not. Not doing the personal work required to heal and grow results in repeating the pattern until the work is done. My first marriage at sixteen, without pregnancy, I realize in hindsight was my escape from painful things happening in my life in that community, so when a handsome prince swept me off my feet, literally and figuratively, and without believing I had any other viable choice, “I do” sealed the deal, but my youth, naivety, and survival drive forced me to run away when force was used at home. My second marriage at twenty-one was the respectable one as I strove to be safe by being responsible … doing the right things … steady, traditional job, buying a first home, etc., but when the quietness settled into the safe life, what began to erupt was the parts of me stuffed away to be responsible and traditional began to bubble up and ultimately led to another divorce, but fortunately also set me on the path to discover who I truly was and to discover how not to repeat the relationship mistakes that led to getting married when I should not have. Sadly at the time when the second marriage was ending, I fell in love like I never had before, for which I was both thrilled and terrified. Thrilled because I had never experienced feeling so liked for who I was as a whole person, not for my body or looks … terrified because of the marriage mistakes and their painful consequences. Ultimately my fear won and my words and actions pushed him away … very far away. The love I most needed first was love for myself in my entirety though first I had to discover what my entirety was composed of and what I needed to do to feel fulfilled, happy, and whole. Much studying and personal change has been required. Learning how to respect … value myself regardless of how others judged or treated me was a key part of the healing process. As was reconnecting with more than just my physical being and intellect. A deep-seated need for a higher connection led me down the path of studying much philosophical and spiritual beliefs, which ultimately brought me back to God, yet with a better understanding than my Catholic childhood years provided. One of the key quotes from the Bible that shook me to the core in a negative way were the words “Wives are to obey their husbands,” which after my experiences certainly did nothing to endear me to the idea of marrying again, at least not without great trepidations. Fortunately, my studying the Bible the past few years shed new light on the often-quoted partial phrase that women are to obey their husbands, but interesting enough, as with people who select the passages of the Bible to serve their purposes, they forget to finish the guidance that a man should cherish his wife and that her glory will be a reflection of his treatment of her. What an enlightening perspective to add to the knowledge of who we are and what we will bring to a marriage as healed, whole, and aware of what love and marriage truly are meant to be … the most beautiful of rewards for hearts and souls willing to do the work to gain the greatest prize. Best work I have ever done … raising my “Respect Level” that helped me learn how to love unconditionally … myself, others, and one day, for the third time, my husband. I know for me the third time will definitely be the charm, for which I am very grateful, though I would have been happy if I knew this before I ever married … which is why I am sharing this with you. Whatever time it has been for you or if you have not yet taken the leap, I hope you also do the personal work, sooner than later, to reap the greatest reward marriage brings … the trust that no matter what, you will be there for each other until the end because you know yourselves and each other, are aware that growth and change is part of who we and our marriages are and therefore are not afraid of the costs we pay for loving so deeply, but are empowered by love to live so boldly instead. Raising my “Respect Level” motivated me to discover how I could become a better person, plus attract and develop healthier personal and professional relationships, which were made possible by learning more about personal development, including developing an understanding of emotional intelligence so my emotions can be used in a good way, not in destructive ways, such as trying to control others or situations, while also learning how to stay calm, clear, and focused during a crisis of any kind. See article “15 Signs That You Are Emotionally Intelligent” Espresso by Paule Cloveau, 3 days ago. Currently available on MSN with 16 slides by Shutterstock with more details and references to sources. Happy reading, learning, and growing! During the past twenty years, after the idea of using respect as a tool to create positive change, came to me during a night of deep despair, sometimes referred to as a “dark night of the soul, “I have shared the core concept with others, though over time I had given the idea different names. At one point in the past ten years, I had even registered a non-profit organization with the precursor name, but dissolved the corporation when met with the challenges of trying to raise funds in the very competitive world of securing backing for good causes. And over time, I have seen people try to take advantage of the years of work I have put into the concept. One woman I admired for her achievements once asked me, “What if someone steals your idea?” and my response was, if they tried to steal the idea then they certainly can’t prove in a court of law they know what the concept is all about … because people with respect for other people and their work, don’t steal their ideas and work. Yet, I have also recently discovered in my Bible studies that when God has given a job to someone, He will protect the person and the work and will deal with those who seek to do harm, whether intentionally or through a lack of understanding that stealing is not just about taking things from people, but about taking anything that does not originate or is not owned by them, in His way and in His choice of timing … so my job is just to stay focused, aware, and then forgive before I can move on. 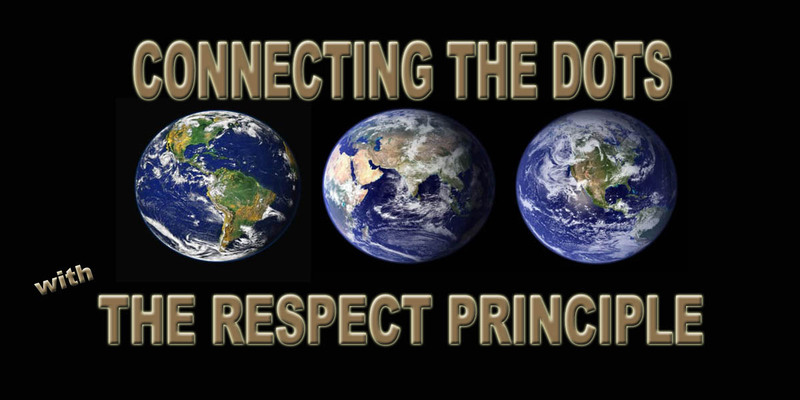 On that note, thanks to all who have expressed interest … community futures development corporations, consultants, advisors and the many others … in Connecting The Dots With The Respect Principle’s core concept, books, products, services, and the business plan. Your enthusiasm has added fuel to the fire I need to keep moving forward. I look forward to bringing the team on board, including a business partner and perhaps an investor for a small percentage of ownership until the investment is repaid at above premium rates, though, of course, I leave the how and when to God and I just keep plugging along. Best wishes to you and your own endeavours, keeping in mind that the heart needs to be the driving force behind the money or the money will destroy any potential good the money and people can add to an endeavour. P.S. Stealing will be talked about more in an upcoming book because I know from experience and study that people often don’t even realize they are stealing if they are taking things, but stealing is taking from someone what is not ours, whether that thing is an object such as food, money, etc. but also innocence, time, wages, fair work week, etc. For instance, with me, as a child, sexual abuse and assault in grade and middle school, along with other things, stole my childhood and innocence way before legal to do so. By my teen years, I had grown accustomed to stealing myself … because it is what adults taught me to do by their actions. If I wanted something I could just take it like they did. Then when I was old enough I rationalized I had the right to get back at people who were taking advantage of me … not paying fair wages for equal work, sexual harassment in the workplace, relationships where people took much more than they gave … so I did take from them, such as taking care of personal stuff on business time or in other ways I could find. But since then, I have consciously made the effort to be honest in all ways … regardless of what other people are doing to me or others and regardless of how hard it is or what others they may think I’m doing, such as retail management, who erroneously believe that all shoppers with backpacks are thieves. Not everyone has a car nor does everyone want to load up a grocery cart every week with stuff they don’t want, such as processed food that isn’t real food, when perishables need to be bought every three to four days for optimal freshness and health. Like all things, our beliefs are a matter of our of perspective … and sometimes our perspectives are out of whack with reality. Of course, since then, I have still made a few not-so-great choices, even bad ones, mostly under great duress as a result of astonishment of other people’s actions or lack of actions, when greatly needed. Yet, I am sorry for my bad choices, regardless of how I justified my actions. Gratefully, God has taught me to forgive all others as I have been forgiven by Him, so I have, and now I do my best to live gratefully … not begrudgingly or retalitorily … and do the best with what I have because utlimately, the choice to act according to our beliefs is ours to make and in our world, the easiest thing to do is what is not right … because many others do it and they want our choices to reflect theirs so they don’t feel bad about their choices … but we are so much more than what we were. The world wouldn’t be the same without you … ha ha … so thanks!